Here is a new coin release from the Mint of Poland. This coin has more features than you can poke a stick at. This is one of the coolest looking coins I have ever seen. The reverse design with the Queens portrait reduced and off to the side bottom corner. And a chunk of moon meteorite thrown on the front. 1st release in new solar system so it is the one to get. Why is the Poland Mint making coins for Nuie Island which is 'Governed' by NZ? Are they contracted to Mint NZ coins? Niue Island is self-governing in 'free association' with NZ which handles its diplomatic affairs. The Mint of Poland makes precious metal NCLT in the name of Niue Island denominated in NZ dollars. Niue uses New Zealand currency and niue coins are basically "granny Bait" (special coins for collectors only). The Niue coins ( that resemble circulation currency) are different compositions and sizes to New Zealand Currency. I have a 2005 (?) $1 Niue coin minted for the 150th anniversary of Thomas Edison inventing the light bulb. On the obverse is a rendition of Edison and on the reverse is a tiny light bulb. You press Edison on the obverse and the light bulb on the reverse lights. Now if an island country can have a coin minted with a battery and light bulb in it, why does the U S have to revert to old coin designs (Walking Liberty half - Buffalo nickel - Mercury dime) to produce "new" coinage? GEEZE ! (21-03-2015, 01:55 PM)Goose Wrote: I have a 2005 (?) $1 Niue coin minted for the 150th anniversary of Thomas Edison inventing the light bulb. On the obverse is a rendition of Edison and on the reverse is a tiny light bulb. You press Edison on the obverse and the light bulb on the reverse lights. Now if an island country can have a coin minted with a battery and light bulb in it, why does the U S have to revert to old coin designs (Walking Liberty half - Buffalo nickel - Mercury dime) to produce "new" coinage? GEEZE ! I'd say the redesign or design of coins and then the cost of minting tools and instruments required out weighs the simplicity of work with what you got. If it aint broke don't fix it. They may not be raking in the big premiums but if you mint massive amounts and sell stacks, all you need is a low premium to get the result? maybe? (21-03-2015, 07:20 AM)Oldcoinchest Wrote: Here is a new coin release from the Mint of Poland. This coin has more features than you can poke a stick at. 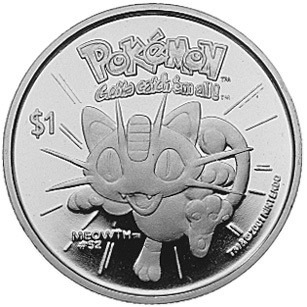 (21-03-2015, 07:20 AM)Oldcoinchest Wrote: This is one of the coolest looking coins I have ever seen. The reverse design with the Queens portrait reduced and off to the side bottom corner. And a chunk of moon meteorite thrown on the front. 1st release in new solar system so it is the one to get. Cool looking. But seriously how are they getting a chunk of the gaseous giants for Jupiter, Saturn coins? (21-03-2015, 07:28 AM)Nevol Wrote: Why is the Poland Mint making coins for Nuie Island which is 'Governed' by NZ? Are they contracted to Mint NZ coins? Niue is one of the "flags of convenience" for the Polish Mint. Presumably, the Polish Mint has been given carte blanche to make whatever weird and wacky "coins" they wish in the name of Niue, and the Niue government will rubberstamp them. At least, I hope this is the case. The Polish Mint was at one stage using Nauru as a flag of convenience, but the Nauru government never actually granted them any such permission. I think they've stopped making Nauru coins now. Roman emperor Marcus Aurelius, "Meditations"
Current time: 26-04-2019, 12:21 AM Powered By MyBB, © 2002-2019 MyBB Group.